I talked to the National Weather Service's Christine Kruse, a meteorologist at the Salt Lake City office. It's obviously dreary outside here in the Salt Lake Valley, so I asked Kruse where elclipse watchers could drive to see the heavenly spectacle. "It's going to be quite a haul. There are clouds everywhere," she said. "[Eclipse watchers] are going to have to leave the Western United States." Not entirely. 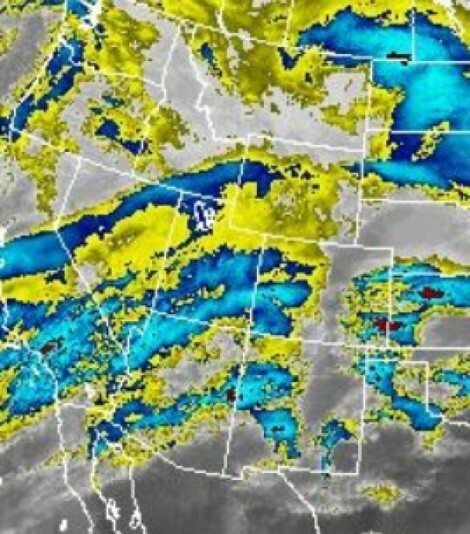 There's a chance, Kruse said, that cirrus clouds in central Wyoming may not completely block the night's sky, but, alas, Interstate 80 has been closed due to snow, so you'd have a hard time getting there anyway. "[Wyoming] has some dry air working into that part of the state, but it would be a very slight chance you would even be able to see it there," Kruse said, so don't risk the winter driving for those odds. "Texas would be perfect," Kruse said. Maybe New Mexico, too. But about the sunsets/sunrises and the 632 years since we've seen such a thing. Imagine you are on the surface of the moon during a lunar eclipse, and thus the earth is directly between you and the sun. Rather than darkness--the earth is too little to completely block out the sun's light--you would see a bright red/orange ring around the perimeter of the earth--that ring's light is all the globe's sunsets and sunrises collectively shining simultaneously as they always do, but rarely could you ever perceive them all at once in one beautiful eyeful. A red-moon lunar eclipse, thus, is the reflection of that beautiful sight. Don't fret. A partial lunar eclipse will be visible from Western States June 26. Maybe that's the date for my oft-delayed trip to Great Basin National Park.